SEGA’s latest game featuring their iconic blue mascot, Sonic Runners (Free), finally came out of soft launch late last week, and if the successes of previous Sonic games on iOS are anything to go by, they’ve probably got a hit on their hands. Opinions have been mixed to say the least, and our upcoming review will likely reflect that, but if nothing else it’s pretty interesting to see a mobile-only game coming from the development team that built the series. In the lead up to the worldwide launch, SEGA kindly gave us the opportunity to ask the head of Sonic Team, Takashi Iizuka, a few questions about the game. While Iizuka wasn’t there at the start of the series, he’s been running the show at Sonic Team since 2010, following Yuji Naka’s departure from SEGA and Akinori Nishiyama’s promotion. He’s got some impressive credits to his name: senior game designer on Sonic 3 & Knuckles, lead game designer on NiGHTS into Dreams, and the director of both Sonic Adventure games, among many other notables. 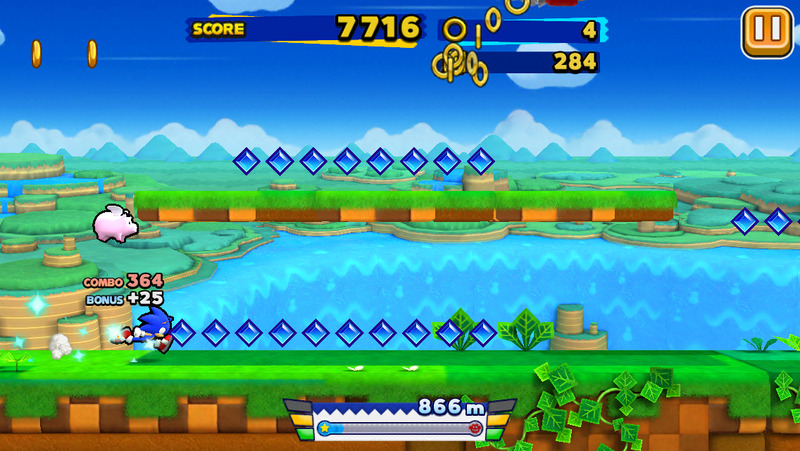 Iizuka was the producer on Sonic Runners, which is Sonic Team’s first mobile-only game. As you might expect, he’s a pretty busy guy, so I’m very grateful to have had the chance to ask him some things about the game. The first thing I had to ask him was how Sonic Team came to develop a mobile-only game. While they had been involved in the development of the Sonic 4 ports to the platform, those were designed for consoles first. Iizuka answered that following the release of Sonic 4, Sonic Team had been thinking that they’d like to take advantage of the unique usability and game experiences that smartphone devices offer. Sonic Runners came out of that. They were especially interested in the ability to add new content frequently and allowing players worldwide to play that content in real time. Iizuka notes that the environments in the game are reminiscent of the SEGA Genesis days, and he and the rest of Sonic Team hope players enjoy the new world to explore. Next, noting the success of the Hardlight-developed Sonic Dash (Free), which recently celebrated 100 million downloads, I asked Iizuka what separated Sonic Runners from that game, beyond the obvious shift in perspective. Iizuka first wished to express his thanks to all the Sonic fans for their support of Sonic Dash. He went on to say that Sonic Runners is a 2D side-scrolling action game with original Sonic-style jumping action. 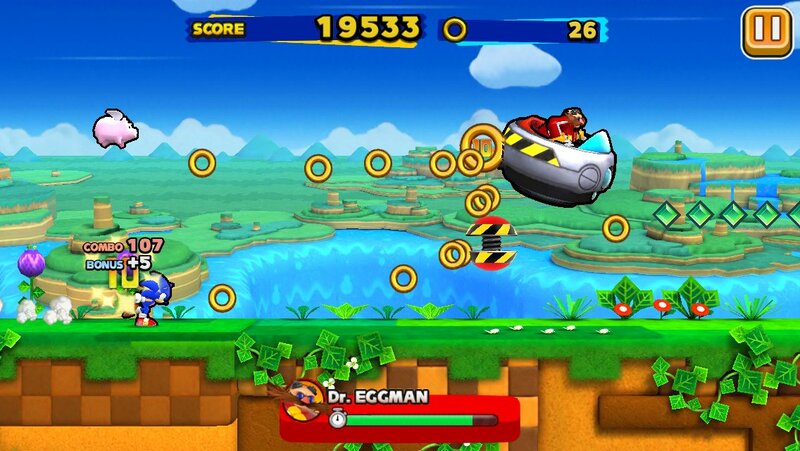 He emphasized that the game has a very “original Sonic" feeling, with fast-paced action that differs in style from Sonic Dash‘s 3D obstacle running. If you’ve played Sonic Runners, you may have noted the game’s somewhat unique structure. It’s not quite endless, and not quite stage-based, either. I questioned Iizuka as to why they went with that particular structure instead of going with an endless set-up like so many other auto-runners use. He describes the game as episode-based rather than stage-based. He points out that in most endless runners, the character just keeps running in the stage without any goal. 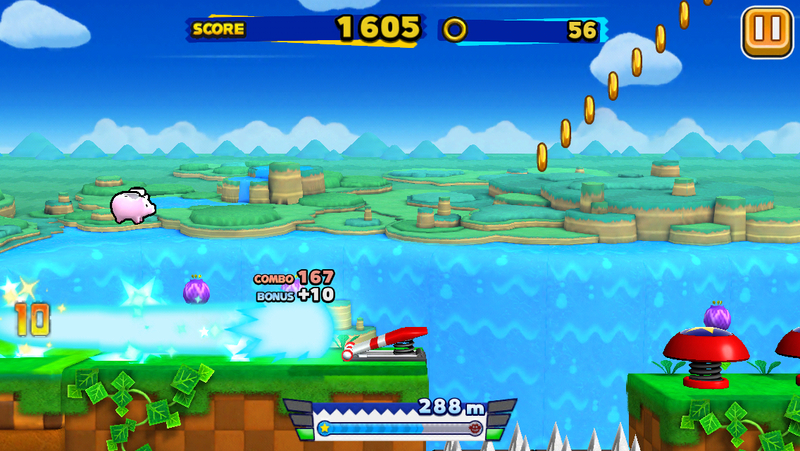 In Sonic Runners, players can enjoy gameplay along with a story. By completing certain goals and episodes, players will receive more of the story, and can enjoy Sonic Runners for a long time. One of the things I really like about Sonic Runners is the buddy system, which packs in tons of classic SEGA cameos from the Sonic series and beyond. The power-ups are also drawn from various installments of the series. I asked Iizuka if he could elaborate a bit on the buddy system. Players can choose two buddies to play with on each stage, he says, and each of them has unique and useful abilities. Sonic Team is planning on adding even more Sonic characters from the previous games in the franchise, so be on the lookout for updates! An interesting thing that players just starting the game might not be aware of is that Sonic Runners has already had cross-overs with other SEGA franchises during the soft launch period. Being an old SEGA fan, I had to get more information about this. In particular, I really wanted to know if we might see Ristar or NiGHTS, characters from non-Sonic games made by Sonic Team. Iizuka replied by mentioning the two collaborations they did in the soft launch with Puyo-Puyo and Phantasy Star Online 2, and states that they will continue working on special events with other IPs to keep Sonic fans satisfied. While we were on the topic of the broader series, I felt this was a good opportunity to find out some juicy information. Specifically, I wanted to know what Sonic character was Iizuka’s favorite, not counting Sonic, Tails, and Knuckles. Helpfully, I offered Big The Cat to see if any other person in the world shared my eccentricities. Iizuka, being a man of finer tastes, said that he of course likes Big The Cat, but his personal favorite is Shadow The Hedgehog. Given his team developed the console title Shadow The Hedgehog, that’s perhaps not too surprising. But hey, Big The Cat! It does seem that for the time being, Sonic Runners will be Sonic Team’s only mobile focus. I asked about the potential of any other Sonic Team games such as Phantasy Star Online, or perhaps some premium games, but Iizuka said that their attention is squarely on Runners for the time being. While the game already has 150 episodes in total, Sonic Team would like to keep adding variety and new content to the game to keep players excited. They’re planning to release more attractive stages and episodes, as well as special seasonal stages, he said. Say what you will about Sonic Team, they’ve always done seasonal content well. Christmas NiGHTS is part of my yearly holiday routine, so let’s hope they can do as well here. The final thing I asked Iizuka was if he and the team had any message for TouchArcade readers. I’m just going to present that here as a direct quote to finish things off. “We ‘Team Sonic Runners’ make an effort to make Sonic fans out of everyone. One of our goals is to get all old/new Sonic characters together on Sonic Runners. I do hope all users enjoy the rival league and world ranking system in which users compete with each other worldwide. Please download Sonic Runners and play it with your friends." Thanks once again to Takashi Iizuka for sparing some of his valuable time, and to SEGA and TriplePoint for providing TouchArcade with this opportunity.